Thanks for fast response, yeah that was exactly what I was asking. Great read, it will be definetly helpful for some edits I am planning. Unfortunately it was not solution for my case, looks like if you put teams from different leagues in a new league the Team IDs are not working the same way as divisions?... The league does work properly if I create "schedule dates" in stages, however the problem with it is that this seems even more complicated to find exact number of dates that would not interfere with dates from other leagues, and so I always got some dates where 1 team would play 3 or 4 games on the same day. Anyway I'll have to do some digging to get this working. And Croatian league as well, because games of croatian teams in IHL are counted for Cro championship as well. I've noticed that the Russian Pervaya League doesn't go beyond the first season. No play offs are scheduled. I've managed to fix via the editor by adding a different schedule set. Anyone else done anything different using the editor? I tried to do Finnish league 4 but I can´t go further than start screen when the game says "select league" error. What should I do? It's about the DEL and DEL2. I have not been able to implement it yet. I have already tried several solutions. Do you have an idea with which settings that is feasible? I have already written with xECK29x . I have not reached BKArchitect yet. I have moved your question to the correct thread. My suggestion is to get the regular season up and running first. Then add the post-season stages afterwards. Take a look at the NIHL North 1 and 2 and the NIHL South 1 and 2 playable leagues in the TBL Rosters as they have the same structure you want to implement. You need to make sure that each league has the other set as its Upper/Lower League (see the Basic Data tab of the Rules & Structures screen). The DEL should have a "1" set as the Relegation End Place in the regular season stage and you should tick the Process Fate Action setting (both on the Stages tab). On the Rules sub-tab of the Stages tab for the regular season stage, make sure you have ticked the Relegation from stage fate rule. In the Playoffs stage of the DEL2 you'll need to tick the Promotion from Stage fate rule. Like I say, check the NIHL 1/2 North and South in the 2017/18 TBL Rosters and this should have all you need. Both of those leagues are set up exactly as how you describe for the DEL/DEL2. Thanks Archi. I will look at this. This part works now. But now I have the next problem. This works. The games are played, but then it does not go on. Later, the game crash. The winning teams should stay in the DEL2. The loser relegate directly to Oberliga and the winner team should stay in the DEL2. For this I have installed a fourth stage. Maybe it works with three stages? I don't know how to set options/settings. I have already tried a lot. I can not get this system to work. Unfortunately, the matchday dates are still not working correctly. I can never get the dates to match what I put in the editor. September/ October always packs the fixtures in and sometimes have 5 or 6 games in a row. Tried so many different options in the editor but nothing works. November onwards seems to be fine as do play off dates ect. is there a way to eddit the host team for Canadian Hockey League Memorial Cup, or if it's totaly random. How it's work? Yes I know your pain. It seems the game struggles with fixture congestion somewhat. I think adding some additional dates helps to some extent. E.g. if you have a league where each team plays 20 games, try adding something like 25 dates. I mentioned this to Riz last year and I believe he was going to look into it. Take a look through the stages and schedules to ascertain what happens on 17 or 18 October. Usually these sorts of crashes are a result of stages not correctly triggering the next one. Click on the Flags tab and you'll see a setting entitled "Pick Hosts from Linked Comps". This tells the game to select a host from the OHL, QMJHL or OHL. I don't think you could pre-set it for a single year. In a similar vein, is there a way to change the host for the Olympics or other int'l comps? It is edited in the same way - via the Flags screen. But you cannot assign an individual host AFAIK - you either set a static host (i.e. it will be the same every time) or you use one of the flags to tell EHM how to randomly pick on. I have been trying to create hockeytvåan (Swe-4) for quite some time now, but have some problems and some questions if it is even possible. 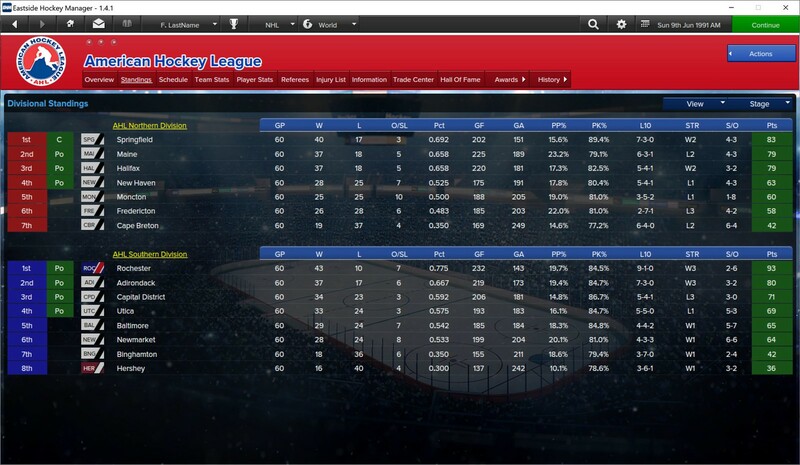 I have created Swe-4 by doing two leagues (North-East and South-West) and then a third league where the top 4 teams from both leagues meet in a best of 3 match series. After that, the four winning teams will play qualifying games for hockeyettan (Swe-3). The only problem is that when it is time to draw 4 teams from each league to the third and last league, it does not find any teams. I have been trying to find a solution but have not succeeded yet. Anyone here who wants to help me? Then I have a question whether hockeytvåan is even possible to create? Since the teams should be able to go down from Swe-3, I wonder if teams will be correctly relegated to Swe-4 through this playoff league that the 8 winning teams from Swe-4 end up in? Yeah I have always struggled with drawing teams from one league to another. IIRC someone else tried to create the Swe-4 but ultimately gave up. There might be some pointers though it you can find the original post. I suggest taking a look at the Memorial Cup and how that works in relation to the CHL. I would also suggest getting the individual leagues up and running separately before trying to add the final stage. 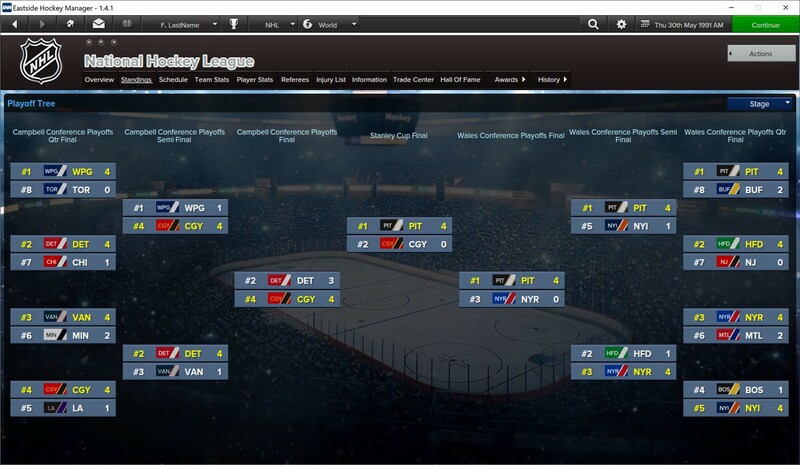 I was wondering if it's possible to make a Championship with a best out of 7 series against the cup winner from the NHL and KHL? I started copying some things from the Memorial Cup and when everything seemed to work, the game crashed during the save creation... but my question is more if it's possible (I don't mind the tinkering part). Yes it should be possible. As you say, it's just a case of tinkering with a clone of the Memorial Cup. 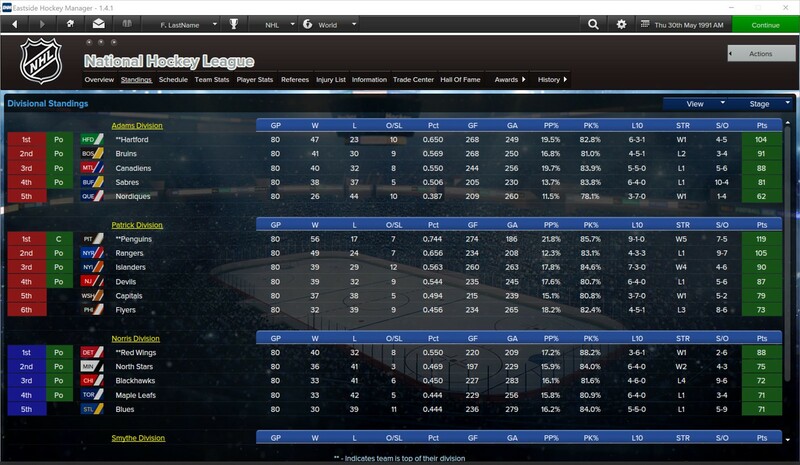 Just for fun, I created the 1990-91 structure in EHM using the UUDB v6.1 as the base database. The bulk of the time was spent on the schedule template and setting up the correct teams. Updating the structure was a pretty quick and simple job - updating a few values and deleting extraneous divisions. I might see if I can make a full on roster update in between work on other things. That's fantastic - thank you! Somehow I've managed to mess up the 1990 playable NHL and now get the error mentioned below. It pops-up three times but it seems just two teams are missing from the league (Quebec and Winnipeg). 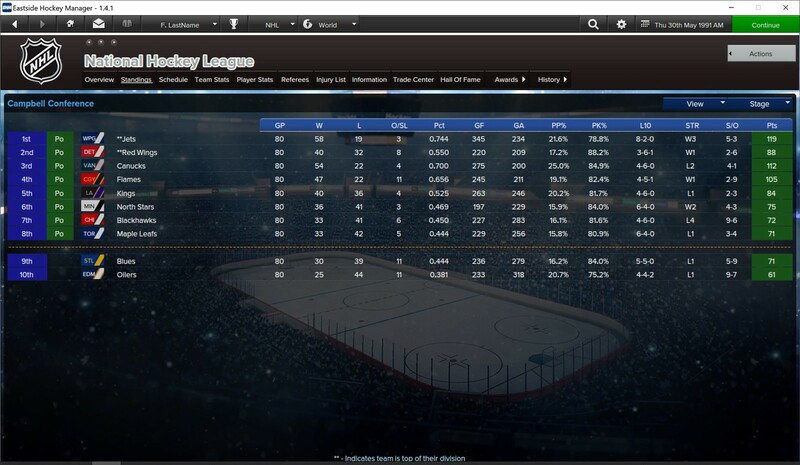 I hadn't touched any of the NHL's settings - all I did was tweak the AHL and add the ECHL. So I'm not sure what I've done to cause the error. I have double-checked everything (including the team's Division and Detailed Division settings) and all looks fine. I'll probably start this from scratch at some point seeing as I kept backups of all my spreadsheets.